Arcaydis DM1 review | What Hi-Fi? The Arcaydis name began life back in 1997, but behind the name is some serious hi-fi pedigree. It's on a bit of a roll, too, having a hand in the well-received EB Acoustics EB1s well as the Arcaydis DM1s. 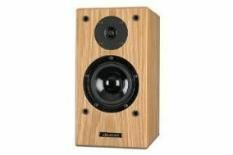 These speakers are available to buy only from the Arcaydis website. Direct selling means costs are kept down, so the DM1s represent fine value – we'd expect to see them selling for plenty more if they were available from a network of dealers. Constructed from a composite material called ARCOLAM, which is made especially by Arcaydis itself, the DM1 speakers look and feel like a serious slab of hi-fi, their weight alone inspiring confidence. the job. For such a diminutive cabinet – it stands just 16cm wide – the DM1s are blessed with a rock-solid bass foundation. Relaying Burial's Etched Headplate, bass notes are as tight and defined as a sprinter's thighs and every bit as powerful when required thanks to superb agility and timing. But these speakers are no bruisers. Play Vampire Weekend's I Think Ur A Contra and there's a level of insight, delicacy and precision that's unrivalled at the price. Vocals are full of emotion, while piano notes are crisp and clean, lingering only for as long as intended. We wondered whether, when really pushed, these Arcaydis offerings might wilt under the pressure or lose control, but there's not a chance. Dynamic, powerful strings from the Gladiator soundtrack sound powerful and raw yet precise and under control, while the grimy attack of The Dead Weather's Pony is handled confidently too, that shouty delivery sounding only a fraction dirtier than perhaps it ought. The DM1s are compact, affordable, easy on the eye and endlessly capable. We thought these speakers were good; if anything we underestimated them. Far more than a great budget speaker, the DM1s will be the last part of your system you'll ever want to upgrade.